Martha Case gestures at a group of trees, pointing out examples of the homely, the exotic and the oddly rare. “There is an Alaskan cedar that’s weeping right there. There is a ginkgo. We have a gorgeous longleaf pine,” she said, adding that the longleaf pine is a native tree to Virginia, but so valuable for timber that most of them were logged out long ago. She is walking through an open area of the William & Mary campus that is much traversed, but little noticed. The area does have a name; it’s called the Greenway, but few know it. On the north side of the Greenway are the backs of academic buildings that front on the Sunken Garden — McGlothlin-Street, Washington and Ewell halls. On the other side are the fronts of undergraduate residences — Chandler, Barrett and Jefferson. 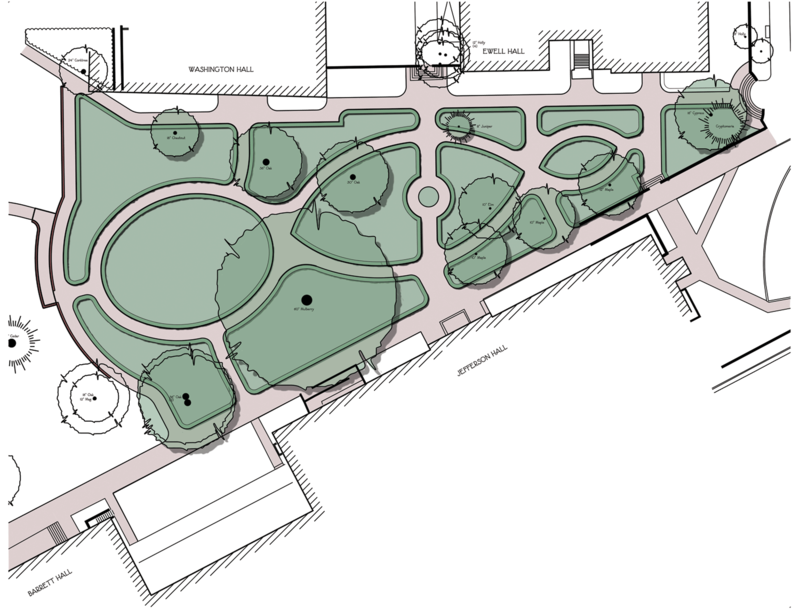 The eastern portion of the Greenway is set aside for future development of the Reveley Garden, honoring the university’s outgoing President Taylor Reveley. The Greenway holds a preposterous diversity of fascinating trees, and Case wants to address any instances of what botanists call “plant blindness” at the university. Case is an associate professor in William & Mary’s Department of Biology and, in addition, holds the title of College Conservator of Botanical Collections. She is updating — and modernizing — the Campus Tour of Woody Species, a walking loop that takes in some of the most interesting trees of William & Mary. Case is working with Herbarium Curator (and bio department websmith) Beth Chambers to update the existing tour web page. Their goal is to develop a mobile app and to install a set of QR code-bearing labels on some of the most interesting trees. And William & Mary has a large number of interesting trees. Many of them are growing in the Greenway, an important stretch of the Woody Species tour. For instance, there is a towering dawn redwood (Metasequoia glyptostroboides), a conifer that Case describes as a “living fossil.” The trees were known only from paleobotany samples until some were discovered growing in China in the 1940s. “Look at that tree! Isn’t that a magnificent tree? And look at the shape of it!” Case grins with appreciation, pointing out the symmetry of the branches, which, at a distance, make the large tree resemble a veined leaf. This particular tree was planted by John T. Baldwin Jr., a faculty member from 1946 to 1974. He brought the dawn redwood seed back from a botanical garden in Belgium. Baldwin is responsible for many of the specimen trees growing on campus. Case also credits the contributions of Jane Henley, who was a volunteer in the old Millington greenhouse and who made important financial contributions to keep the plant collection maintained. Case and Chambers are producing the latest, most high-tech version of a compendium of trees at William & Mary. There has been one version or another of the plant census for decades. Back in her office, Case opens a venerable, comb-bound index of plants on campus. It dates from 1980 and was updated in 1992, a work of another of Case’s botanical predecessors, Martin Mathes. The diversity of plants on the grounds is due in large part to geography, Case said. Williamsburg is at the center of a kind of botanical Venn diagram; it’s a place where habitats overlap, she explained. The North and the South meet just here and so it’s about as far north as you can expect southern trees such as magnolias, live oaks and longleaf pines to thrive. By the same token, species like bigtooth aspen, Eastern hemlock and northern white cedar, more at home in the North, can usually do pretty well alongside the southern trees. The William & Mary campus is even more tree-diverse than the rest of the Peninsula, being the repository of interesting species introduced by Baldwin and other arboriculturalists dating back to colonial times. Case recently went out to measure the circumference of a singular specimen, a white mulberry that’s a relic of a failed colonial industry. The mulberry that Case went out to measure is the sprawling specimen that spraddles out over a large portion of real estate to the north of Jefferson Hall. It’s as impressive a specimen, in its own vertically challenged way, as the looming dawn redwood. A significant, well-loved tree, the massive white mulberry features prominently in schematic plans for the Reveley Garden. After tossing her measuring tape, Case found that the main section of the trunk measured about 12 feet in circumference at ankle height, a figure that might include two trunks that have grown together. “And you are supposed to measure a tree at chest height, but…” Case says, making a wry face at the slumping, largely horizontal, but clearly thriving, mulberry tree. The tree census and the number of woody species on campus naturally vary, and Case works on tending and planting new specimens with John McFarlane, the university’s associate director of gardens and grounds. Case says that William & Mary is poorer in trees, in terms of absolute numbers and in number of species, than when Mathes produced his compendium. Storms, age and other vicissitudes of nature have taken their toll, she said, as has construction on campus. There are a lot of trees left, though, including some noteworthy specimens. For instance, the City of Williamsburg boasts 22 noteworthy campus trees in their Heritage Tree Program, including specimens that reach an enormous size for the species. The dawn redwood is one such champion tree, rivaling the largest in the nation. On the other side of the metasequoia are a couple of “dreadlock trees,” better known to botanists as Cryptomeria japonica. Case was puzzled by a campus visitor’s request to know the name of “the trees with dreadlocks,” until one day she was walking by a Cryptomeria and it struck her that the foliage did indeed resemble a conifer reincarnation of Bob Marley. Case said that Baldwin was particularly fond of Cryptomeria and planted it profusely around campus. The dreadlocked Cryptomeria are pretty easy for even a botany novice to identify, but the trees of William & Mary can toss the occasional identification challenge at even tree experts like Case. She waves her measuring tape at one such puzzle. The tour loops around from the Wren Building past the Sunken Garden and over the Crim Dell Bridge. It takes in the Newton trees outside Small Hall, then back, up through the Greenway (and eventually, the Reveley Garden) back to the Wren. The revised, reviewed and modern tour will feature the interesting mature trees —loquat oak, the metasequoia, the dreadlock trees (not necessarily under that name.) It also will feature recent additions to the arboreal population. For instance, the young bald cypress newly planted around the chalkboard north of Hardy— usually found in very wet areas, “with their feet in water” — Case said they’ll be on the tour, along with many, many others.